Snehadhara Foundation (SF) is a registered non-profit organization based in Bangalore. With a vision to foster a culture of respect and belonging Snehadhara aims to create inclusionary spaces that welcome, acknowledge, affirm, and celebrate the value of all learners. It is the only organisation in the country that works using Arts Based Therapy as a primary methodology in working with children and adults with disabilities. We have crafted three initiatives in pursuit of this goal: Direct Care, impART and Prajnadhara. 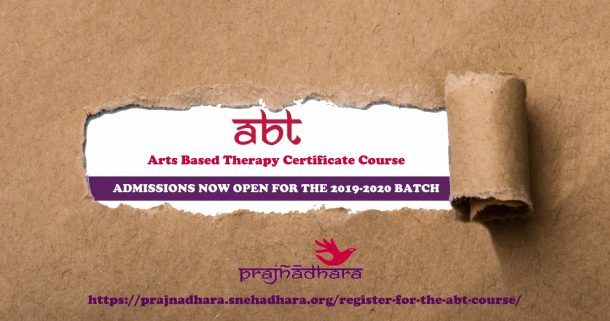 Prajnadhara, a division of Snehadhara Foundation is offering the Arts Based Therapy Certificate Course in Bangalore and aims to collaborate with other NGOs, learning centres, schools and institutions to implement ABT. The twin goals of Prajñādhara are Arts Based Therapy Certification and Study of the Mind. The Direct Care space at Snehadhara is our realm of caring and practice. Respecting every child’s unique needs, our programs are carefully designed to enhance their abilities and meet their therapeutic goals. The use of Arts Based Therapy forms the foundation to healing and learning in this program. Our aim is to address the social and independence goals of the children to meet their aspirations for life, vocation and livelihood. Our Direct Care Centre works with children and adults with developmental disabilities that include Down syndrome, Autistic Spectrum Disorders, ADHD, Cerebral Palsy, Mental Retardation, Speech Delay/Impairment, Learning disorders and mental illnesses along with their caregivers and families. impART, a division of Snehadhara Foundation is a platform that looks at interventions, methodologies and practices using the Arts in schools, colleges, corporates and the community to create an inclusive society. We want to eliminate economic status as a variable in receiving the care that children and adults with special needs deserve. So our program relies on voluntary contributions to bridge the gap. We are enthused to seek Personal, institutional & corporate funding support to ensure that we have a sustainable financial model.